The differential treatment between those low-paid workers who fraudulently claim benefits and those top bank executives who launder hundreds of millions of pounds for drug cartels or pariah states tells you all you need to know about the class basis of justice in the UK. A person claiming benefits while working can get up to a year in prison with all the shame involved, yet the bank director responsible for HSBC Mexico, which handled a colossal $376bn of suspect money for the US bank Wachovia, gets off scot-free and is even, in flagrant disregard for the law, promoted to become head of HSBC global retail on a multi-million dollar salary. There could not be a more blatant example of one law for the poor and quite another one for the rich. Not only that, but the bank too was let off very lightly. None of its senior employees was prosecuted, and the bank itself was fined £1.2bn which was less than 5 weeks’ income from HSBC’s US subsidiary. The US Justice Department decided that there should merely be a 5-year deferred prosecution. The bank said it would partially defer bonus compensation for its most senior officials during this period, meaning that they would still get substantial bonuses but slightly less than before for a limited period. There was no question of bonuses being completely dropped, let alone their recipients being prosecuted. So why hasn’t the bank (so far) been prosecuted? It has been reported that the US federal and state authorities chose not to indict HSBC on charges of vast and prolonged money laundering, even though they knew that operatives from the Sinaloa narco cartel regularly came to the bank’s branches and deposited hundreds of thousands of dollars in cash in a singly day into a single account, using boxes fitting the precise dimensions of the teller windows. It was said the authorities feared that “criminal prosecution would topple the bank and in the process endanger the financial system”. The implication is that HSBC is not only too big to fail, but even too big to jail. That shows just how far under the ideology of deregulated market capitalism criminality on an industrial scale is viewed as beyond the reach of the law. But HSBC is a British, not a US, bank. So why wasn’t vigorous action taken against HSBC by the British authorities over the enormous Mexican scandal in 2012 and why isn’t equally firm action being taken by British law enforcement against HSBC over its Geneva bank scandal. Only when top executives, including Green who was CEO at the relevant time, are charged with criminal failure to exercise proper oversight in massive breaches of the law involving tax evasion on a massive scale and, if found guilty, given a hefty prison sentence will this pillaging of State tax receipts be closed down. I do not know the fact is all this happened on a labour period in power, it ended of course once the bank knew somebody had the evidence, and as the HSBC has said they have sorted it all out no need for governments. You used Cameronj and Osborne you may as well use Blair and Brown the love affair with the banks is well known now and we are paying for it. I’ve no time for people who claim benefits and then work either. But in the end you know something none of this should be a suprise to us. 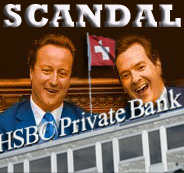 HSBC resides in City of London Corp and is part of the Establishment – QED?